SEUTTER - Imperii Magni Mogolis sive Indici Padschach..
SEUTTER,M. - Imperii Magni Mogolis sive Indici Padschach..
Imperii Magni Mogolis sive Indici Padschach.. - SEUTTER,M. Date : Augsburg, ca 1740. Size : 19.5 x 22.4 inches. / 49.6 x 57.0 cm. Description :Impressive map of the Mongol Empire, including present India (except the southern tip), Pakistan, Afghanistan, parts of Burma, etc. Decorated with two coloured pictorial cartouches, a sailing ship and a fishing boat. 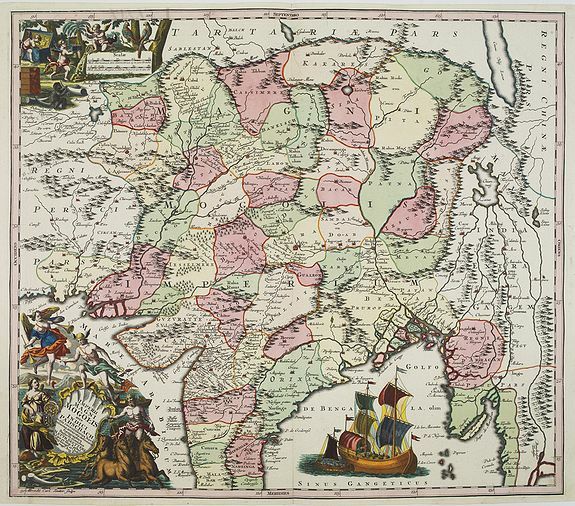 Usually 18th century maps have only body colour and uncolored cartouches. The so-called "Fursten kolorit" has coloured cartouches and particularly rich and strong colours. Condition : Mint. In so-called "Fursten kolorit". A good and dark impression, printed on heavy paper.